Another Tiny House Story: The Pod is SOLD! We are still in disbelief! 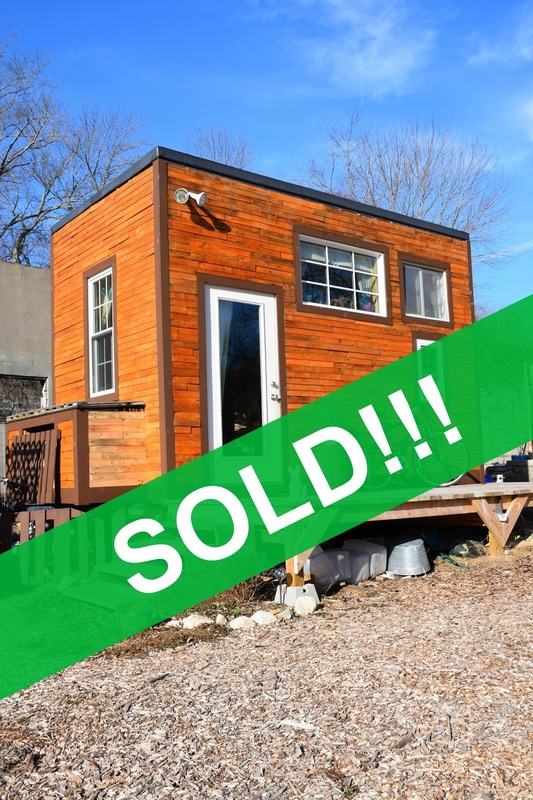 The Pod has sold! That was very quick! And it might have happened even sooner, had we not been out of town for a week! The very first person to reach out to us, Sarah, saw the For Sale posted by our good friend Deek of relaxshacks.com and emailed us immediately. She told us she had seen the Pod the year before when we did our first tour with Deek. It had stayed on her mind since, as she loved many of the unique details about our tiny house. I honestly could not be happier with who the Pod will go to and once we learned her plans for the Pod, we were even more excited. She lives on a farm in NH and hosts several workshops surrounding farm practices, permaculture, and all that entails with such a lifestyle. She wants to be able to use the Pod as an artist in residence! For some basic care-taking of the farm property, a student or artist could enjoy a cozy and inspiring place to live and create. And get this-- she has invited us to attend a workshop in the future, with the chance to stay in the Pod! We could come visit our "baby"!! AWESOME! As she looked around the Pod and we continued talking, we learned that she has a lot of the same values and priorities. She loved the layout, was happy about the lack of plumbing- which makes winterizing much easier! And she also said that all the re-used and reclaimed materials and labor of love that went into this place was just the best frosting on an already lovely cake! Congratulations to you Sarah, and thank you so much! Needless to say, Dan and I jumped around and did a happy dance or two last night! Then we went out to celebrate with some beverages and dinner! WAHOO! This is by no means the end of our tiny house blog, either. We plan to keep tiny living close to heart as we take on this new chapter of our lives! I have still have some cool things to share about the Pod, and we have a lot of fun plans to visit other tiny houses throughout the coming years! Now that my boys are grown and I am single again, I have been looking at options to downsize and save money. I am a simple person and the tiny house revolution keeps coming up. I am going to check it out. This article is great and very encouraging. I hope I get an opportunity to share a similar experience soon.